Hester was voted by Huntingtonian readers as issue three's athlete of the month. This season was a new experience for the men’s soccer team – they finished .500 after going 5-13 in 2014. 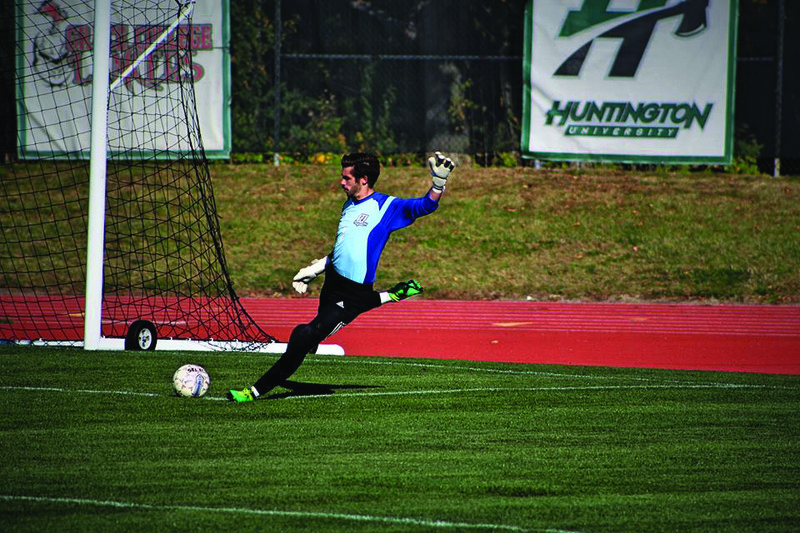 It was also different for sophomore keeper Troy Hester – he matched his 2014 saves total in a single game. Hester credits a diligent off-season regiment for both the team’s and his individual improvement from one season to the next. He said the Foresters were “honestly more busy in the off-season than the season” with weights, scrimmages and indoor leagues in Fort Wayne. “I heard from some of the other players that it was one of the hardest off-seasons we’ve had in a while,” Hester said. Hester made six appearances in varsity play during his freshman season, but nearly quadrupled his minutes this season – making 12 starts – as he made his way into the varsity ranks. After he collected 14 saves – the most for a Forester in a single game since at least 2007 – in the team’s third game against Lawrence Tech, he started all but one of the remaining games on the schedule. “Troy definitely has the ability to make all the saves and is continually developing his vision and organization of the backline,” head coach Russ Lawson said of Hester’s improvement. Hester displayed this quality in one of the team’s many overtime wins this season. In the nail-biter against conference foe Taylor University, he saved a Trojan shot with seconds remaining to help his team hang on until the buzzer and for an eventual win in extra minutes. Hester said he’s played soccer “all of his life” since beginning at age four in a local recreation league with his dad coaching. Hester is no stranger to hard work. In high school, Hester participated in club soccer, and he said he remembers a time where he was participating on three teams at once. In one instance, two of his squads – his high school’s and one of his club’s – went head-to-head. He couldn’t play for both, but stuck with his allegiance to his high school. “We lost, so I guess I picked the wrong team,” Hester recalled with laughter. Hester, a native of Liberty Center, Ohio, said he found the university his junior year through a club teammate, Sam Barrett, who joined the Forester roster a year before him. Hester, a graphic design major, said he picked the university because of its full package – a strong graphic design department, soccer team and campus experience. Moving forward, Hester said, despite the improvements displayed in 2015, his team has work to do to produce a winning season, especially as they will lose several key players to graduation. Lawson said he is confident that Hester will play a role as an upperclassman in both off-season training and in future seasons.